Sign In or Sign Up FREE! Manage Digital & Paper Files! Find Both Digital & Paper with One Search! Turn your paper into PDF files and also easily find the remaining paper in your office. The Simplest Digital Filing System in the World! Do You Want to Organize Digital Files, Paper or Both? Finally, a product that allows you to organize your ENTIRE office in one place. You will have one screen to search for all of your information, be it in PDF format from the paper you have scanned or if you have the paper in your file cabinets, as most businesses do. Many people are starting to move to a more paperless environment but still have a great deal of paper that they must manage each day. The combination of Paper Tiger and the NEW Digital Tiger makes it possible to easily convert your paper to PDF files and store them in the amazing product Google Docs. In addition, using Paper Tiger, you can easily index your physical paper files and find them while searching for your digital files...all in one search! Digital Tiger is FREE with your paid Paper Tiger Online account (Basic or Pro plans). Our original product, Paper Tiger Software in the market since 1995, revolutionized how tens of thousands of organizations/individuals manage their filing and paper (hanging file folders). Paper Tiger greatly SIMPLIFIED filing by eliminating the problems found in traditional alphabetic methods and made finding paper files in the office faster and much more reliable. 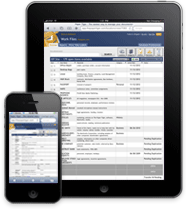 The software is a very powerful, yet simple indexing system for paper office files. It works like a search engine for paper files to help you stay organized. People using the software can save over 150 hours per year by eliminating the time-consuming task of looking for lost information. People so love the software that they have expanded its use to many things other than paper! As the power of computers has increased, the cost of disk space has decreased and the cloud has become secure, reliable and robust, more and more people are looking for a digital solution for at least some of their paper files. This lead us to create Digital Tiger. 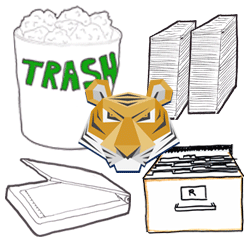 Digital Tiger and Paper Tiger work together seamlessly to provide you one place to find BOTH your digital (Word, Excel, PowerPoint, PDFs and almost any other file type) AND your paper files in one search. Using both products, you will be able to "Find Anything in Your Office in 5 Seconds or Less...Guaranteed! Digital Tiger is powered by Google Docs. This means that you will be able to scan some or all of your paper into PDF format and store the PDFs, along with almost any other digital file, into your ultra low cost and amazingly powerful Google Docs account. Other document management systems in the marketplace are too complex and too expensive. Digital Tiger, working seamlessly with Paper Tiger, allows you to easily find anything you have filed, digital or paper, very quickly from one interface. Monticello combines this with great training and support to provide you with a total solution to allow you to easily setup your digital paper management/document management system and make your organization more efficient with minimal effort or cost. Digital Tiger and Paper Tiger are both designed to be easy to setup and simple to use. Powered by Google Docs, you can be assured that your data will be there when you need it with a 99.9% guaranteed system uptime and a company the size of Google Docs storing your valuable information. In addition, you will be getting great new features automatically as they are introduced. Who can use Paper Tiger? Since 1995, over 20,000 organizations have trusted us to help manage their paper! Get Control and Clear Your Desk! Paper Tiger helps companies, non-profits, government agencies, professionals and individuals get control of something they hate...filing the paper on their desk & in their office. Now anyone can start solving their problems with paper in less than 60 seconds with our FREE FOREVER account. If a messy desk is your problem, if your alphabetic filing system breaks down each time you have staff turnover, if members of your team want to be able to quickly and easily share information in the office or if you are wasting too much time each week looking for lost information, then Paper Tiger could be just what you need. The product is designed for anyone who wants to get a better handle on the paper-based information in the office. Now, with the addition of the NEW and FREE Digital Tiger (included with a paid Basic or Pro plan Paper Tiger Online account), you can also start moving to a more paperless business environment using the amazingly powerful, yet quite inexpensive Google Docs. Digital Tiger, which is powered by Google Docs, will allow you and your business associates to have incredible tools to convert, manage, manipulate and store your scanned PDF files and virtually any other document format to the cloud. All the while, you can rest assured knowing that your files are protected and safely stored with Google Docs. Many people would just like the paper in their life to go away but somehow it seems to keep coming. This is especially true in business. There are only 5 options when you are considering how to handle the paper in your world. You can toss it, stack it, alphabetize it, scan it or index it. Each of these methods has its advantages, but in today's computerized world, if you have any volume of paper whatsoever, you will save a great deal of time using a computer to either scan or index your information using a system like Paper Tiger/Digital Tiger. See your 5 Options with Paper. Using the Paper Tiger and the NEW Digital Tiger, you or your team will be able to access your information from anywhere with an Internet connection. You will no longer have to worry about what computer you are using (Windows, Mac, Linux, etc.) or if you have backed up your data because you are storing your files in the very secure, always backed Google Docs cloud. Our newsletter contains great tips on how to use Paper Tiger, stay organized, and be more productive! Don't worry, we will not send spam or stell your email address! Tom Fulner, Dynamark Graphics Group, Inc.
Deb Colling, Professional Learning Alternatives, Inc.
Steve Goldfarb, Goldfarb Law Office, P.A. Randolph Hinton, RH Wealth Advisors, Inc.
R T Quigley, ProDisCo., Inc.
Jeanine Davis, Davis Painting, Inc.
Jesus Dacal, Encore Int'l Trading, Inc. Type your question below to begin a live chat session.